The cups are filled with Burgundy, the meat is fried on swords and served on vintage plates and the ‘Queen’s pendants’ are going to be offered. Until September 15th, when ordering shashlik, you will have the chance to feel the historic atmosphere of Musketeers meals. 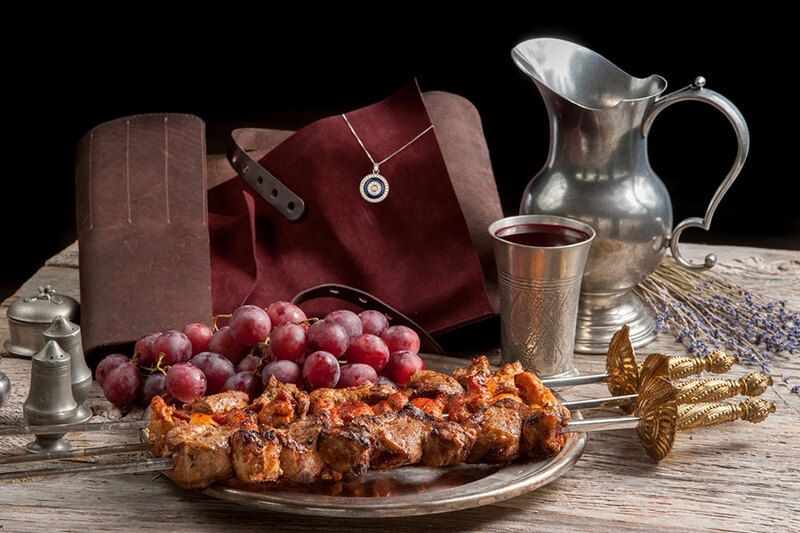 The meat fried on swords will be served with grapes and you will have 5 shashlik options to choose from: chicken (750 rubles), turkey (890 rubles), pork (1050 rubles), lamb loin Kara style (2200 rubles) and sturgeon (2200 rubles). Burgundy sauce can be served upon your demand. And your cups will be filled with pitcher wines BourgognePinotNoirLeRenard \ ChateaudeChamirey for particularly nice price of 640 rubles. This enogastronomic journey will culminate with a draw of exquisite diamond jewellery from ‘Jewellery 1919’ boutique collection and gift certificates for dinner in Bochka restaurant. ‘Jewellery 1919’ is a jewellery shop located on 15, 1ya Tverskaya street, where you can find the best works by Russian jewelers of the highest class. The pendant is made of white gold and diamonds in the ancient technique of hot enamel hand-painting that was used by Carl Fabergé. The draw results will be announced on September 15th. Please, follow the announcements on the restaurant’s website and Facebook and Instagram profiles.